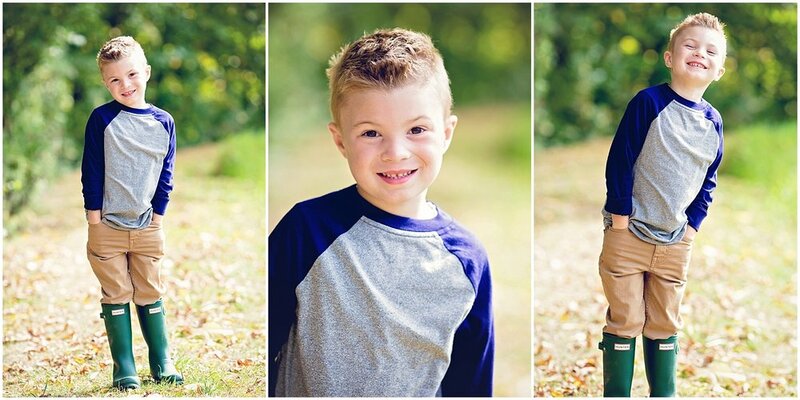 There was quite a bit of discussion trying to decide on the perfect location for Sam's 6 year pictures. After photographing five years worth of photo shoots, you can say we've burned through quite a few ideas already! Then Erica thought of her uncle's land, complete with a lake, dock, and canoe. I'm ALWAYS excited for a new spot to explore and I was not disappointed. You guys, it was like a dream. The sun was peeking through the trees, making sparkles come to life in the lake and casting that perfect photographer's light over the entire scene. As always, Erica had some fun ideas in mind, but mostly we just let Sam have fun fishing! It's something he enjoys doing anyway so it was easy to get him on board. While he and his grandpa got the canoe out I took a few shots of just Erica. This was a little extra something fun because we just so happen to both be lip bosses! In fact, she's my SeneGence upline and the one who introduced me to LipSense. Another reason I love this gal! I met Erica six years ago when she hired me for Sam's newborn pictures, but over the last year I've really gotten to know her better. She's an absolutely beautiful person, inside and out, a great mama to her little bear, and one of the most generous and giving people I've ever met. All of that being said, it goes without saying that I am super excited to share the highlights from Sam and Erica's lakeside photo shoot!